Ramona Gardens is a public housing development in the Boyle Heights neighborhood of Los Angeles, California, USA. It is operated by the Housing Authority of the City of Los Angeles. Currently and historically Latino, it is also the home of the Big Hazard street gang, connected to the Mexican Mafia, and has been the center of the illegal drug market in all of Southern California. The development abuts the Interstate 10 and is part of LAPD's Hollenbeck Division. 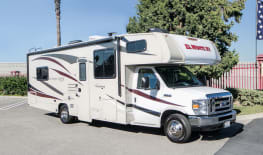 Luxury Fleetwood - 3 slide outs!